The Mets put a beatdown on the stanky Padres in the first inning, and the game was basically over before I had a chance to settle in on the couch. The Mets put up a seven spot against Jhoulys Chacin. I’d like to make fun of the Padres starting pitcher, but he’d probably be the 4th starter for the Mets right now. 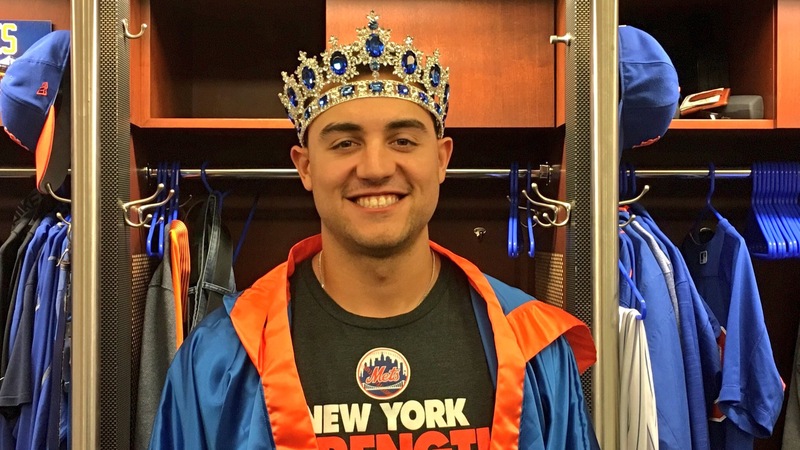 King Conforto: Michael Conforto went 3 for 4 with 2 home runs and 4 RBIs. He had a leadoff homer, and he capped the seven run first inning with an RBI single. He was the king last night. He’s been the king all season. It’s ridiculous to listen to fans argue about whether or not Conforto was mishandled last season. The guy has posted a 1.138 OPS in 153 plate appearances, and now everyone is convinced that if he was given more rope prior to his demotion last year he would have figured things out and been extremely productive. I think that argument is flawed, but I don’t really care that much. I’m happy he’s here now and performing like a stud. I’m looking forward to the return of Yoenis Cespedes. I want them back to back in the same lineup. I don’t care if they bat 1-2 or 2-3 or 3-4. I just want Yo behind Conforto. That’s a scary combination. Never Pay Pitching: As we all watch the young Mets pitchers deal with one physical obstacle after the other, it certainly serves as a reminder that paying starting pitchers is a risky proposition. Fans are losing their mind over Harvey’s descent into mediocrity. But could you imagine the reaction if the Mets had extended him and he was getting paid like 12 million bucks while performing at this level? The masses would be calling for his head. Matt Harvey was mediocre again last night. He pitched 5 innings, gave up 2 runs on 3 hits and 4 walks. I can’t complain though. He kept the Mets in the game. Considering how poorly the starting pitchers have performed in 2017, I will take that Harvey outing every night. Bruce Tightness: Jay Bruce left the game with back tightness. Schedule the backiotomy for later this week. Curtis Granderson has played better of late and Bruce has been cooling off so I won’t be that upset if Jay misses a few games. Reinforcements: Steven Matz and Seth Lugo were both smoked in their minor league rehab starts last night. Frankly I’m shocked to hear they are even rehabbing. Hopefully they remain on track to return by the end of this month. Moron Terry: Terry decided to use Jerry Blevins in a 9-3 blowout last night. Collins was mixing and matching relievers last night and making pitching changes in the middle of innings. What’s wrong with him? He’s really slipping. Screw Judge: The NY Post initially ran an article this morning titled “Patient Mets fans have their own Aaron Judge in Michael Conforto.” From what I can tell they have since changed the title. Can you imagine being such a delusional Yankees fan editor that you think it’s appropriate to run a headline that makes it seem like a player who has posted an .847 OPS over 695 plate appearances (Conforto) is somehow just starting to measure up to a guy who has played in 68 major league game (Judge)? Are you kidding me? Conforto was smashing World Series home runs in 2015 when Judge was probably car pooling to the Yankees’ Triple-A park in Scranton. The Yankee media bias is always nauseating. Today: Robert Gsellman starts today. Can he give us 5 innings and under 5 runs? Is that too much to ask? I mean God forbid the guy finds a way to give us a quality start.